“The only unchangeable certainty is that nothing is unchangeable or certain”, so said John F. Kennedy once. Every now and then, one passes through an anniversary of a significant event and is forced to reflect on life, and its many unusual twists and turns. I haven’t lived in Australia (which I still consider “home”) for just over two years now. Those who know me well, know that I sometimes harp on about living life “on one’s own terms”, but looking back, I can’t help but notice that many of the most significant changes in my life were brought about by chance events, over which I had absolutely no control, most of which I could not have possibly predicted. It is difficult to trace the origin of my particular meandering brand of life to any single event, but the beginning seems like a good enough place to start. I was born, it is believed, on the 5th of December 1981 somewhere in Taiwan. The reason I say “it is believed” is because I was adopted and I have yet to trace my precise origins. Although I probably wasn’t aware of it, it is easy to see how my life was, from the outset, already steeped in uncertainty. But far from being merely a bridging-paragraph to introduce the reader to the deeper story by way of a cute but somewhat superfluous anecdote, this story has further substance. I was originally meant for adoption by a Canadian couple. Although I am sitting in a motel in Calgary writing this, those who know anything about me know that I am not Canadian, but ended up being adopted by a couple from Hong Kong when the paperwork from the other couple fell through.2 (of course, I didn’t know any of this until much later in life, but that is another story entirely). There’s something almost romantic about arriving in a new place to begin a new life with nothing except your bags. But by the time you are doing it for the third time, it gets old. The first time this happened, my move from Hong Kong to Australia, had been a long time coming. Most of the move was arranged by others as I was young at the time, and I had known that I would move for a long time prior and had plenty of time to become mentally prepared for the move. The other two instances – the move to New York, and the Netherlands, both happened very quickly. For the New York move, I had all of four months to prepare myself while the lead-time for my move to the Netherlands was an even more ridiculous 6-weeks. What kinds of circumstances can prompt a person to just pack up and move to a completely different place? War, famine, and civil unrest come to mind. Thankfully, I was never forced to move for any of those reasons. Quite the opposite, in fact. To move me to New York, I was offered admission to a masters degree program at Columbia University – not the kind of opportunity that a person of my lowly academic record passes up. An education at an institution like Columbia as well as the chance to live in New York, along with all the career prospects there was just too good. It would take something incredible to tear me away from a place like New York, but as it happens, just such a thing came up. The opportunity for a chance (albeit slight) of speed skating at the 2010 olympic winter games (and having all expenses paid for in the meantime). But what is change? It is the opportunity to grow as a person, to learn, possibly to reinvent yourself. It is often a hard pill to swallow. The circumstance of my move to Melbourne were met with some resistance because I first moved into boarding school. It is not an experience I would wish on anybody yet I would be the first to acknowledge that I learned a lot from the experience. I did not learn discipline (as was the intention of my parents) but instead learned more useful skills such as how to pick locks, evade security guards, and avoid gangs of racist redneck farm-boys. I also learned a valuable life-lesson to do with reinventing oneself. When you move to a new place, few people know you, and sometimes nobody knows you well. You aren’t weighed down by the burden of your past life or reputation. So what though? You make little (or big) adjustments to your exterior, but it shouldn’t make a difference to what’s inside. This of course presupposes that what is “inside” is unchangeable and is not affected by what goes on “outside”, which is clearly not the case. This is, in my belief, one of the most valuable things you can get out of a change of place. You have this perfect opportunity to not only realize that you can reinvent your image, but also to realize that the terms by which you define yourself and your whole personality rest on similarly shaky and superficial grounds. So the funny thing is, by simply changing your location, you can realize your potential to change yourself. That being said though, escaping from oneself is not always so straightforward. When I lived in Australia I was very heavily involved with Amnesty International. During my involvement, I accumulated a bit of a reputation. It wasn’t a bad reputation – quite the opposite, but because it had grown so large (even larger than my ego) it annoyed me. It bothered me how people knew of me before they knew me. I would get special treatment, I would get a lot of attention. People would judge me, and form opinions of me based on what I had done, and not on who I was. When I moved to New York, I decided that I would continue involvement with Amnesty, but since I found my reputation burdensome, I would make an effort not to tell many people about any of the things that I had done. The plan seemed simple enough, but it did not go as I intended. It seems that, even though limiting the people who saw my CV was easy enough, all the things I had learned could not be unlearned. My extensive experience in many aspects of governance, event planning, campaign planning, and the like all somehow managed to make themselves known to the world. Although I carefully shied away from any important formal positions, I have a suspicion that my standing in the social hierarchy of the group was much higher than I wanted it to be. Certainly much higher than I intended it to be. It seems that it is more difficult to escape oneself than I originally thought. As Popeye so eloquently put it – “I am what I am”. Where does that leave us? Is it possible for a person to change? Yes. But it takes effort. You are what you are, but what you are is partly defined by what you do, and that is largely in your hands. When you move from place to place a lot, you are often asked where you consider as “home”. To overuse a cliché, home is where the heart is. Where that is will vary for many people. For some, it will be to follow a passion be it fishing, mountaineering, or speed skating. For others, it is with family, or close friends. Sometimes a person’s heart can simply belong to one other person. You don’t really know until you’ve had to go without. If moving from place to place has taught me anything, it has taught me about what is and isn’t truly valuable in life, and to appreciate it. 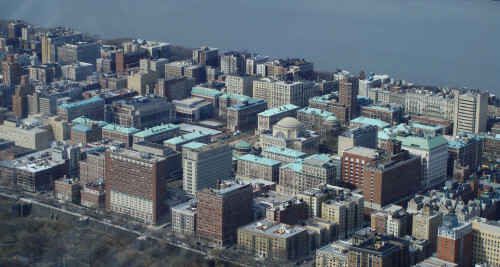 Finally, as evidence that change on the inside does indeed happen, and on a fundamentally profound level, I present this aerial photograph of the Columbia University campus which I took on my first ever trip to New York in March 2007. This photo is unusual in that it elicits a strong emotional response in me. What’s more, is that that emotional response has varied enormously over time. When it was taken, I had been rejected from a PhD program that I had applied to. During that trip, this was as close as I could bring myself to the campus, and every time I saw this photo, I would whisper to myself “so near, yet so far”. A mere two months later, I was unexpectedly accepted to a masters degree program there and the emotion quickly changed to a combination of disbelief and excitement. When I finally arrived in September, even my lofty expectations were greatly exceeded and the experience really changed my life. The emotional response to this photograph continued to be disbelief, but the giddy excitement and anticipation that had been there before was slowly replaced by a sense of belonging and, dare I say it – achievement. By the time I left New York, the feeling of belonging, possessiveness even, was accompanied by pride, as well as that strange feeling you get when you sense that something great is coming to an end, like the end of a roller coaster ride, and a feeling I had felt previously towards the end of my time at Melbourne University. Now, I look upon this and feel a sense of longing, for I miss the Columbia Community and all that it stands for. I also miss the student life and all the amazing friends I made while I was there. Change can be jarring, it can be traumatizing. But you can use it to realize a change in yourself (for the better, one would hope), after all, we could all use a little change.